He proposed to her with a bouquet of black roses, and she said yes. They set the date and time: November 1, midnight. Her parents were a bit concerned—the two hadn’t known each other long. They could mark they day she had met him: she had lost the blush in her cheeks and had gone paler as the fall moved along, she began wearing everything black, including her lipstick and nails, and her perfume changed from her familiar baby powder to overripe blackberries scented with the underlying note of decaying roses. A cool air eddied about her. They invited him for dinner. He seemed an enigma: charming, handsome, and inexplicably, a vegetarian. Her mother’s pot roast languished in the kitchen as they all picked at their mashed potatoes and roll. Neither could remember a thing they had talked about but he left a good impression. The nuptials were planned for the Angel Manor. 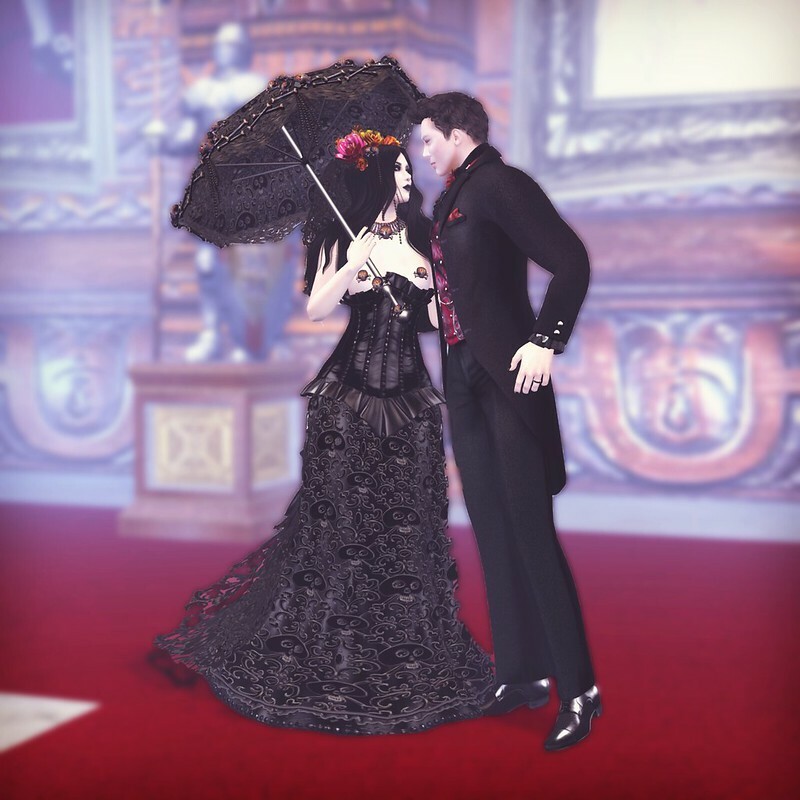 She chose a dress she had gotten on the TAG Gacha, a rare Black Wedding dress from Chandra Meehan that included all the accessories in a beautifully-made custom mesh. The lace of the layered skirt had a subtle skull motif as did her necklace and hair ornaments. A brilliant rose arrangement, which included color-change flower sets, accompanied her veil and she carried an old-fashioned parasol. Her father was a bit uncomfortable at her bared breasts but skull shaped pasties covered the vital parts and well, the dress was certainly inexpensive as a gacha. Thora Charron provided her beautiful hair, a flowing dark look that fell over her shoulders in romantic waves. And Tuli Asturias’ skin for Tres Chic was her look of choice, a translucent powdered skin with such flawlessness, such delicacy that the veins of blood running under her skin could almost be seen. It provided a pale contrast to her dark makeup from Constance Daehlie. I’m clapping because it’s Genre’s birthday this month, so the designers participating have made a bunch of great birthday-themed items. I pulled a couple out for this post. First is this FABULOUS stripper cake from Plurabelle Laszlo. Who knew someone who made such sweet shoes and hair and jewelry could make something so naughty and fun? Included with the cake is a great set of animations including those that tuck you far away from the cake so your floaty name tag can’t be seen (surprise!) plus singing, clapping, dancing and POLE DANCING! I will be hauling this around to every birthday celebration I am invited to. I donned Chandra Meehan’s naughty-but-nice balloons and streamers birthday suit from Genre for popping out of the cake. 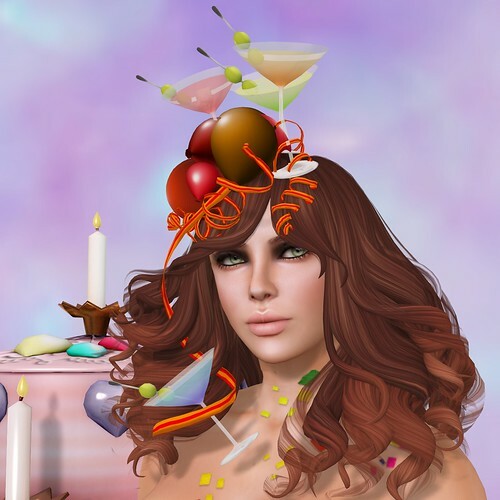 With Omega and Belleza appliers, she gives you a whole look for a sort of burlesque “Happy Birthday, Mr. President” set up with martinis and balloons and little else. Mr. Beresford saw the ensemble and claimed it was his birthday, so I wrapped my arms around his neck and sang just like Marilyn, my soft curls from Truth Hawks’ newest ‘do tickling his neck while martinis poured out on his lap. The theme of Genre this month is “Mer-folk,” so clearly a shot over Linden water is in order. I wore Chandra Meehan’s gorgeous mermaid tail as part of my look. With a mesh center piece and gorgeous tails that combine mesh and flexi and translucency, this mermaid tail is spectacular. The tail comes in several colors—not just this lovely electric blue. 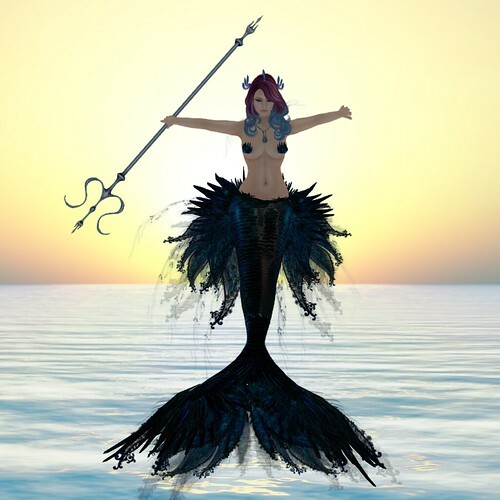 My trident is also on sale at Genre in three colors to accessorize a mermaid or merman thanks to Tala Laval. Horns on my head from Draconius Timeless make my mermaid a watery creature rather than just a lovely woman. They come with a great scaly headbase and would suit both men and women. 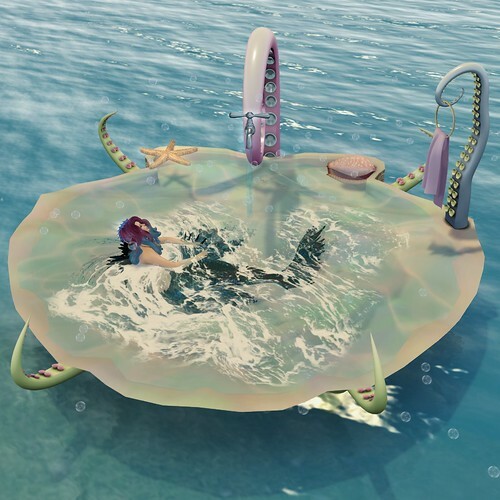 The life of a mermaid is no doubt stressful, and Spooky Mistwallow knows every girl deserves a Calgon moment, so she made this darling tentacled bath for Genre. With effervescent bubbles that emerge from the tub and an animated foam, the tub is a place where a mermaid can relax and bathe or, feel frisky, bring her merman in for some intimate moments as the bath includes both single and couple poses. It even comes with a darling tentacle towel holder. My glorious skin is Tuli Asturias’ new release for Skin Fair 2014. As usual, she givse us her shapely nose, beautiful lips and brows, and soft blush. Tuli’s face is exquisite, though I am biased—I was always a Tuli girl. Her skin comes in three tones with appliers sold separately. I have dressed the skin up with a makeup from Constance Daehlie that includes little fins to beautify the look and deep murky eyes from Cruella Pennell make my mermaid watery. My necklace, which could be seen as an octopus or alternately as Chthulu, I suppose, holds a brilliant egg. 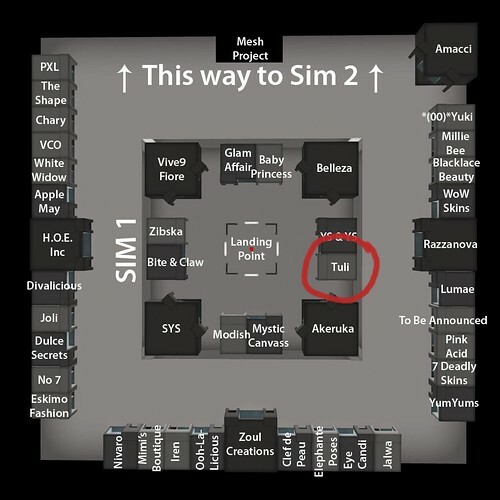 Tiffy Vella is really mastering mesh! All are available at Genre. Finally, I chose a recent hair from Queue Marlowe with her brilliant ombre coloring to top my mermaid off. “If you swim effortlessly in the deep oceans, ride the waves to and from the shore, if you can breathe under water and dine on the deep treasures of the seas; mark my words, those who dwell on the rocks carrying nets will try to reel you into their catch. The last thing they want is for you to thrive in your habitat because they stand in their atmosphere where they beg and gasp for some air.” ~ C. JoyBell C.